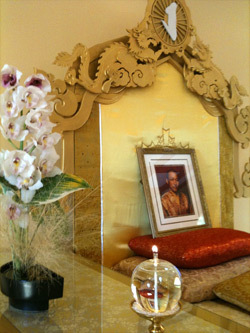 Creating our Shambhala Centers is a process of joining Heaven and Earth. Through developing, uplifting and expanding our Centers, the Sakyongs’ vision for creating enlightened society can be established on this earth. The Sakyong’s Advisory Panel on Shambhala Environments was formed based on the wishes of the Sakyong, to help with that process. It’s mandate is to assist the community as a whole, by reviewing all projects of any substantial scale, throughout the Shambhala mandala within the City, Practice, Retreat and Land Centers. The Advisory Panel works in conjunction with the initiating Centre and its development or design team, along with the Kalapa Executive, the Kalapa Council or when necessary, the Sakyong or the Sakyong Wangmo themselves. The review process is collaborative, emphasizing the empowerment and authority of the local team. The recommendations of the Advisory Panel reflect the intentions of the Sakyong and the governing bodies of the mandala. The panel is empowered to advise centres and groups on how best to apply the fundamental principles of Shambhala to their diverse conditions and requirements. It is important that Centres inform the Advisory Panel in a timely fashion with regard to any relocation, expansion or renovation of their facilities, so that an appropriate path of development and review can be established for their project. The Panel is available for review and advice at various specific points in a project’s path, depending on the scale and complexity of the project, from first envisioning through complete development. For further details please see: The Panel Review Process. The Panel review process is collaborative, emphasizing the empowerment and authority of the local team. Given the range of possible projects for any given Center, the specific path and opportunity or need to engage this Panel will vary, but some of the basic steps are listed below. For further information please see: Stages of Development. It is assumed that prior to any review by the Panel, the mission of the Centre and its role within the Shambhala Mandala, as well as any needs assessments, or strategic and financial planning necessary for the project will have been clarified by the initiating Shambhala Centre or entity, and reviewed and/or approved as needed, by the Sakyong or his governing Councils. Note: Bold type indicates the possible involvement with the Panel. The Panel’s aim is to provide its basic advisory services on a voluntary basis as an offering to the Shambhala lineage and mandala. Depending on the scale and complexity of a project, the Panel may not be able to voluntarily support a complete and thorough review process. This would be determined on a case-by-case basis. Where it is not possible to provide a full review voluntarily the Panel strongly encourages the Centre to hire a Shambhala professional as part of their design team. This helps ensure the best understanding of the Guiding Principles involved in creating a building or environment that expresses our unique Shambhala culture. Along those lines, panel members may be hired as part of the design team at the discretion of the local leadership and at a fee to be determined by both parties. Please go to Design Services on this site for more details about hiring your team.